Hot dogs have never been seen as prime cuts of meat, but a new study has found human DNA in some samples. The study, conducted by food analytics lab Clear Food, analyzed 345 different hot dogs and sausages, including vegetarian versions. Altogether, 75 different hot dog brands from 10 different retailers were studied. The researchers found that there were issues with more than 14% of the samples analyzed. In particular, two percent of the hot dog samples contained human DNA. Interestingly, two-thirds of the samples with human DNA were from vegetarian hot dogs, indicating that the meat-free options had more hygiene issues than the regular sausages. To be clear, the presence of human DNA does not mean there is human flesh in the hot dogs. While it may be the time of year when horror stories are passed around, the researchers believe that what they’re finding traces of isn’t from chunks of human flesh, but rather from poor quality control standards that are resulting in human DNA entering the products in the forms of saliva, skin fragments (such as dry skin flakes), hair, and broken fingernails. All of these things can contaminate meat on the production line as it’s prepared and packaged. While researchers from Clear Food state that human DNA is unlikely to pose any health threats, they believe the information should be made available to the public and that people should be able to decide for themselves whether they are comfortable eating hot dogs given these findings. Clear Food also found other problems with the hot dogs, including mislabeled ingredients, which could raise concern among religious and vegetarian groups. Hot dogs were found to contain different types of meat than what was listed on the label. Beef, chicken, pork, and lamb were all found as unlisted ingredients. Researchers highlighted the pork, which was found in beef and turkey hot dogs, as a particularly problematic result, given that some religions forbid the consumption of pork. The study indicates that many people could be eating pork without realizing it, although kosher hot dogs were found to be safe. Vegetarian hot dogs were also found to contain traces of meat, suggesting that they may not be as meat-free as advertised. Hot dog ingredients have long been a source of controversy. 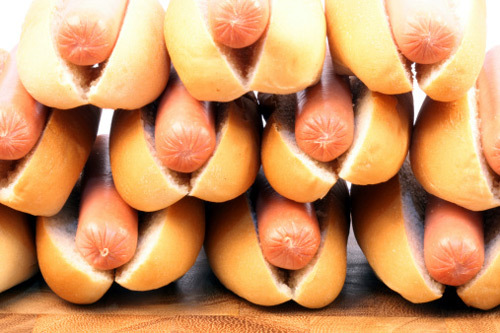 Sometimes referred to as “mystery meat,” hot dogs have often been the target of rumors. As one example, in the mid-nineteenth century, rumors suggested that butchers used dog meat for their hot dogs. Even with this stigma, hot dogs and sausages are incredibly popular in the U.S. Last year, Americans spent more than $5.0 billion on hot dogs and sausages. For hot dogs without human DNA, the study found that Walmart, Target, and Safeway were the safest retailers to buy from. Kosher hot dogs were the safest choice for products containing no pork. “The Hot Dog Report,” Clear Food web site; http://www.clearfood.com/food_reports/2015/the_hotdog_report, last accessed October 30, 2015. Horton, H., “Human DNA found in hot dogs – and 10% of vegetarian sausages contain meat,” The Telegraph web site, October 27, 2015; http://www.telegraph.co.uk/news/worldnews/northamerica/usa/11956947/human-DNA-found-in-hot-dogs-vegetarian-sausages-contain-meat.html. Meers, W., “Hot Dogs Contain Human DNA, Veggie Dogs Contain Meat: Study,” The Huffington Post web site, October 28, 2015; http://www.huffingtonpost.com/entry/hot-dogs-dna-veggie-dogs-meat_562e45abe4b0ec0a38950dc5. Oaklander, M., “This Could Cut Your Health Costs by $25,000 a Year, Study Finds,” Time web site,October 13, 2015; http://time.com/4071897/stress-relief-healthcare-costs/. Schulte, B., “Harvard neuroscientist: Meditation not only reduces stress, here’s how it changes your brain,” The Washington Post web site, May 26, 2015; https://www.washingtonpost.com/news/inspired-life/wp/2015/05/26/harvard-neuroscientist-meditation-not-only-reduces-stress-it-literally-changes-your-brain/.